Keio 3 nen 8 gatsu hi. Blade length :　70.9 cm or 27.91 inches. Sori : 2.27cm or 0.89 inches. 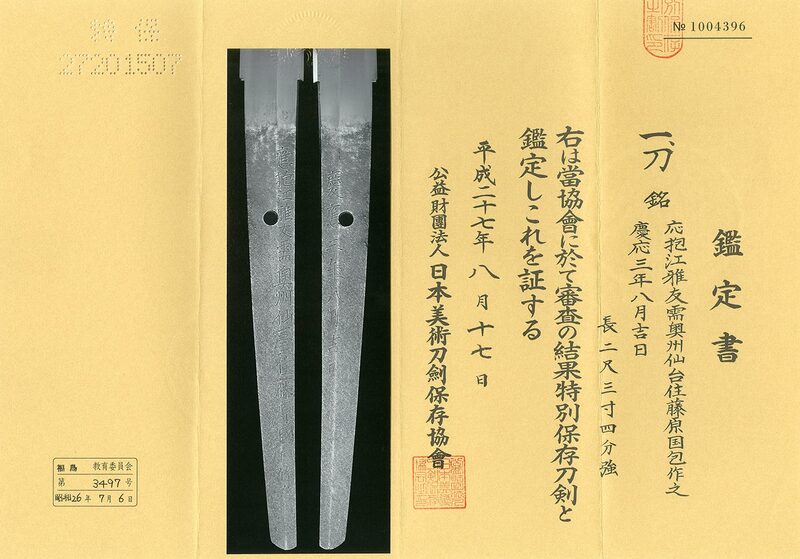 Width at the Kissaki : 2.41cm or 0.94 inches. Era : Late Edo period Keiou era. Jigane :Masame hada well grained with jinie attach beautiful nice texture. Hamon : Suguha hamon with koashi and double hamon. continued late Edo period 13th generation. this masame hada until to continue to late Edo period. Fuchikashira: Fans are engraved with gold colr. high ranking polisher. We recommend this sword for you. Midway island in Pacific ocean. AOI Art estimation paper :NBTHK Tokubetsu Hozon Token.